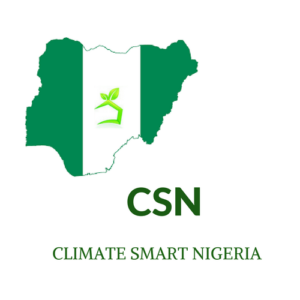 CLIMATE SMART NIGERIA (CSN) is the arm Of Glow Initiative which is set up to combat environmental problems like Climate change and improve the nations power sector by spreading the awareness of Climate Change to curb climate illiteracy and promoting the intervention of renewable energy. A CLIMATE SMART Nation is an economy that is growing with consciousness and awareness that Climate Change is real and all around us, and taking deliberate action to adapt and mitigate it. Our goal is to attain a Climate Smart Nigeria, and to do so, we are placing efforts on awareness creation on Climate Change and Renewable energy through the education sector and the new media, because people need to first KNOW about the menace before they can learn the solutions. When this is done, people will understand the reality of Climate Change and action steps to combat it. 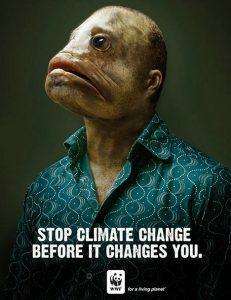 In November 2015, our founders life completely changed when she came across an article that included an image tagged “Stop Climate Change Before it Changes You” (Image shown below) where a man is shown with a monster-like fish head as a sign of reverse evolution that might occur if climate change and ice-melting continue at such current alarming rate. She also came across a campaign organized by the Beacon organization entitled Evolution. The campaign asks you the following question: “Ready to go back where we came from?” The question is accompanied by an image where a human being was shown with fins and gills like a fish to illustrate the long-term consequences of global warming and its irreversible effects. A glimpse of the possible effects shows how the human body might evolve in order to deal with the environment change. We might end up with fins, flippers, and gills, due to the ice melting. The campaign used evolution in such context to illustrate the catastrophic effects of global warming. The fact that the air is very unclean and that if nothing is done to combat Climate Change human beings might evolve in order to deal with the change, look disfigured and age much faster than they are supposed to made our founder decide to do everything within her capacity to stop the menace. Having no prior knowledge of Climate Change, this inspired her to carry out researches about the causes, effects and impacts of climate change. In so doing, she discovered her answers for causes of Climate change, effects and the role of everyone to adapt and mitigate climate effects and wrote a book with her new found knowledge ‘The concept and science of Climate Change’ for public awareness and ‘Something is Happening; Our world is Changing’ for schools. As she progressed in research she found out that a majority of the Nigerian population (70%) are not aware about Climate Change, which means that a solution to the menace cannot be possible when majority are unaware. She began to look for ways to solve the problem of low awareness and proffer solutions to combating climate change, Hence, Climate Smart Nigeria was born informally in January 2016 and formally April 2017. The issue of Climate illiteracy which stems from low awareness of Climate Change. 70.4% of Nigerians are not Climate Aware Which means that of the 185,986,686 persons in Nigeria, a whooping 130,032,798 are not aware. 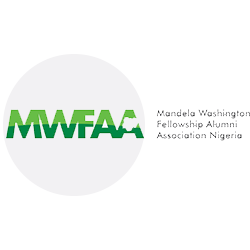 Which leads to death of SMEs and forces millions of Nigerians to depend hugely on fossil fuels thereby contributing to climate change. Our 10 year plan is to attain a Climate Smart Nation come year 2026. We expect to see a Nigeria whose 70% of her population is conscious and aware about Climate Change and taking deliberate action to adapt and mitigate it.